Niagara-on-the-Lake Hydro Board concerned with Continuing Rise in Cost of Electricity - Niagara On The Lake Hydro Inc.
May 1, 2018, Niagara-on-the-Lake – The Ontario Energy Board (OEB) recently released the Regulated Price Plan (RPP) rates for May 1, 2018 to April 30, 2019. Adjusted for the Fair Hydro Plan the rates decreased very slightly. The OEB report also provided what the rates would have been without the Fair Hydro Plan based on actual expected costs. This shows a substantial increase in the cost of electricity as shown in Chart A (below). RPP rates rise for three reasons: increases in the actual cost of generating electricity, increases in savings provided to large industrial customers whose cost is passed on to be included in the RPP rates and decreases in overall demand for electricity which reduces the base over which the locked-in costs are spread. The Board of NOTL Hydro believes that all these factors are driving up the actual cost of electricity but is growing increasingly concerned with the falling demand. 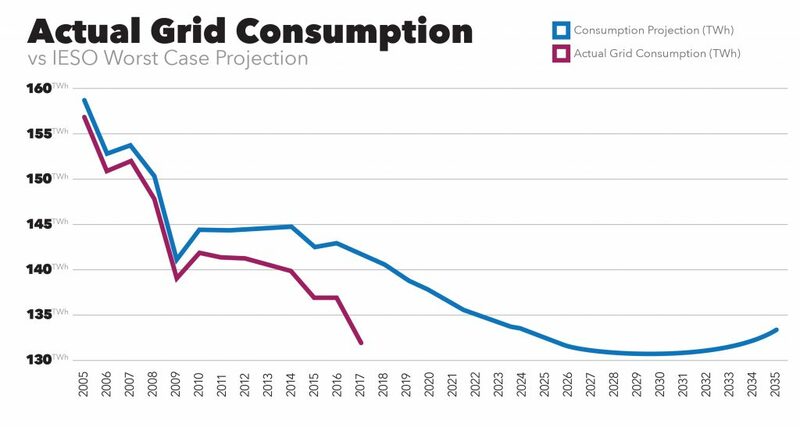 Chart B (below) shows the worst case projection of total provincial consumption to 2035 provided by the IESO in their 2016 Ontario Planning Outlook. It also shows the actual electricity taken from the grid each year to 2017 as provided by the IESO. Prior to 2016 the difference between the two lines is generation on local distribution grids which is included in the consumption number used in the projection but not in the actual results provided annually by the IESO. For 2016 and thereafter the difference between forecast and actual consumption becomes a factor. Even allowing for this confusion, it is clear that in 2017 consumption for electricity fell more than the worst-case projection. 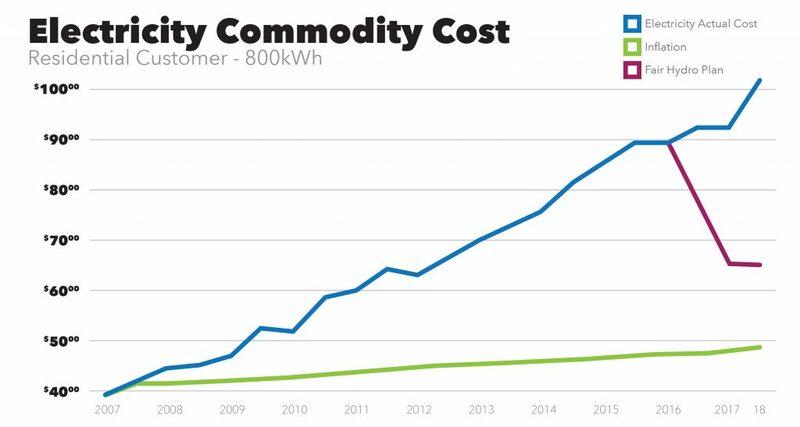 If this trend continues then the true cost of electricity will continue to rapidly rise. The Board of NOTL Hydro calls on all the provincial parties to truly address the rising cost of electricity rather than just promising lower rates based on borrowing to cover ongoing costs. The Board of NOTL Hydro has previously urged the Minister and the Premier to take steps to reduce the high cost of electricity in Ontario and has provided concrete suggestions.